There’s a lot to love about Valentine’s Day: sharing your love for your family and friends through colorful hearts and delicious, delicious candy. Sadly, there are a few things not to love from the Earth’s perspective: like wasteful packaging, synthetic fabrics and plastic everything. Luckily, we’ve got a little eco-friendly Valentine’s Day roundup worthy of the heart eye emoji. While those rayon glitter heart PJ’s are super cute, they could pack a nasty toxic punch. Conventional fabrics (even cotton) are treated with pesticides that can be absorbed through the skin. For your eco-friendly Valentine’s Day, choose responsibly sourced organic cotton pajamas for women, men, and little ones: how amazingly adorable is this rainbow heart footie? As a bonus, all of Primary’s fabrics are tested to meet OEKO-TEX Standard 100, meaning they’ve been deemed free of over 300 toxic treatments and chemicals. Conventional chocolate’s manufacturing process is not so sweet, haunted by impoverished farmers, child labor and deforestation. But, that doesn’t mean you can’t enjoy a delicious chocolate treat on Valentine’s Day. Here are 12 Fairtrade chocolate companies to support for your eco-friendly Valentine’s Day gifts! Many of these brands are available on online retailers alike Amazon, and Chocolove is even available at some larger grocery chains. TCHO has taken their efforts one step further, taking a stand against slavery and partnering directly with their growers. Whimsical decorations can be eco-friendly! Who is going to miss plastic with decorations like a rainbow of seed paper hearts or these gorgeous rainbow seed paper butterflies? And we can only imagine the delight on little faces if they got to set off these eco-friendly push pops of water soluble rainbow confetti on their way out the door on Valentine’s Day morning! Skip the conventional gift of red roses (that likely have a huge carbon footprint and a laundry list of toxic pesticide treatments) and make some flowers with your kids! We love this tissue paper tutorial for little hands, as well as this gorgeous origami folded paper flower video for bigger kids. These eco-friendly Valentine’s Day bouquets will last much longer than a fistful of tulips – and so will the memories of making them together. 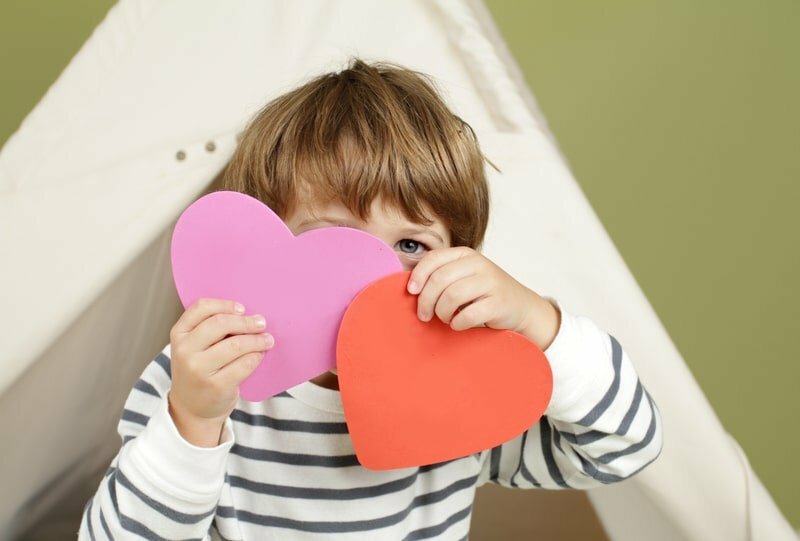 For more fun craft ideas you can do with your family, check out these 6 eco-friendly Valentine’s Day crafts for kids. We love the homemade scratch-off cards! Or, if you can’t resist the beauty of nature, consider giving your sweetheart a potted plant from a local nursery instead of cut blooms. Ugh, scents. We are staunchly anti-fragrance as you can read about in-depth here and here, but suffice it to say: fragrance is just a way of hiding toxic ingredients for many manufacturers. If you must purchase a candle, check out our post on scented candles (serious and potentially dangerous indoor pollutants) first, and then seek out a brand that utilizes pure coconut or beeswax with no fillers (like paraffin). As far as perfume goes, we honestly can’t make a recommendation that we would feel is truly safe, as even formulas that utilize natural fragrances and essential oils may not be any safer or less likely to trigger allergic reactions than your department store special. On Valentine’s Day, and all year long, we’re here with our revolutionary cleaning system, Force of Nature, designed to help you keep your home clean without exposing your family to toxic chemicals. What’s not to love about that? Tips For The Eco-Friendly Home Of Your Dreams In 2019!